The hummingbird hawk-moth (Macroglossum stellatarum) is a species of moth. It was first described by Carl Linnaeus in his 1758 10th edition of Systema Naturae. 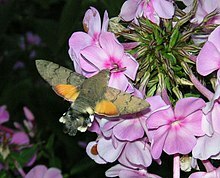 The hummingbird hawk-moth is distributed throughout the northern Old World from Portugal to Japan, but it breeds mainly in warmer climates (southern Europe, North Africa, and points east). Three generations are produced in a year in Spain. It is a strong flier, dispersing widely in the summer. However it rarely survives the winter in northern latitudes (e.g. north of the Alps in Europe, north of the Caucasus in Russia). Moths in the genus Hemaris of the family Sphingidae are known as "hummingbird moths" in the US, and "bee moths" in Europe, which sometimes causes confusion between this species and the North American genus. Two or more broods are produced each year. The adult may be encountered at any time of the year, especially in the south of the range, where there may be three or four broods. It overwinters as an adult in a crevice among rocks, trees, and buildings. On very warm days it may emerge to feed in mid-winter. The glossy pale green ova (eggs) are spherical with a 1-millimetre (0.039 in) diameter. They are said to look like the flower buds of the host plant Galium, and that is where the female lays them. They hatch 6 to 8 days after laying. Up to 200 eggs may be laid by one female, each on a separate plant. Newly hatched larvae are clear yellow, and in the second instar assume their green coloration. The larva is green with two grey stripes bordered in cream along the sides and the horn at the rear end typical of sphingids. The horn is purplish red, changing to blue with an orange tip in the last instar. They feed fully exposed on the top of the host plant and rest in among a tangle of stems. Although dependent on warmth and sun, the larval stage can be as rapid as 20 days. The pupae are pale brownish with a prominent, keeled proboscis, and two sharp spines at the end of the cremaster. They are enclosed in loose silken cocoons among the host plant debris or on the ground among leaf litter. The wing action is frozen in this photo by using electronic flash. This picture was shot in Hanko, Finland, latitude 60°N. The forewings are brown, with black wavy lines across them, while the hindwings are orange with a black edge. The abdomen is quite broad, with a fan-tail of setae at the end. The wingspan is 40–45 millimetres (1.6–1.8 in). In the southern parts of its range, the hummingbird hawk-moth is highly active even when temperatures are high, and thoracic temperatures above 45 °C (113 °F) have been measured. This is among the highest recorded for hawk-moths, and near the limit for insect muscle activity. Its long proboscis and its hovering behavior, accompanied by an audible humming noise, make it look remarkably like a hummingbird while feeding on flowers. It should not be confused with the moths called hummingbird moths in North America, genus Hemaris, members of the same family and with similar appearance and behavior. The resemblance to hummingbirds is an example of convergent evolution. It flies during the day, especially in bright sunshine, but also at dusk, dawn, and even in the rain, which is unusual for even diurnal hawkmoths. Its visual abilities have been much studied, and it has been shown to have a relatively good ability to learn colours. Hummingbird hawk-moths can be easily seen in gardens, parks, meadows, bushes, and woodland edge, where the preferred food plants grow (honeysuckle, red valerian and many others). Their larvae usually feed on bedstraws or madders (Rubia) but have been recorded on other Rubiaceae and Centranthus, Stellaria, and Epilobium. Adults are particularly fond of nectar-rich flowers with a long and narrow calyx, since they can then take advantage of their long proboscis and avoid competition from other insects. Examples of such plants include Centranthus, Jasminum, Buddleia, Nicotiana, Primula, Viola, Syringa, Verbena, Echium, Phlox, and Stachys. They are reported to trap-line, that is, to return to the same flower beds at about the same time each day. Hummingbird hawk-moths have been seen as a lucky omen. In particular, a swarm of the moths was seen flying across the English Channel on D-Day, the day of the Normandy landings in the Second World War. ^ Cuadrado, M. (2017). "The year-round phenology of Macroglossum stellatarum (Linnaeus, 1758) at a Mediterranean area of South of Spain (Lepidoptera: Sphingidae)". Revista de Lepidopterologia. 45 (180): 625–633. ^ a b c d e f g Pittaway, A. R. (1993). The Hawkmoths of the Western Palaearctic. London: Harley Books. ISBN 978-0-946589-21-0. ^ a b Herrera, Carlos M. (1992). "Activity pattern and thermal biology of a day-flying hawkmoth (Macroglossum stellatarum) under Mediterranean summer conditions". Ecological Entomology. 17: 52–56. doi:10.1111/j.1365-2311.1992.tb01038.x. hdl:10261/44693. ^ Kelber, Almut (1996). "Colour learning in the hawkmoth Macroglossum stellatarum" (PDF). Journal of Experimental Biology. 199 (5): 1127–1131. PMID 9318956. Retrieved October 21, 2011. ^ "Hummingbird moths colonise UK". BBC. 10 June 2016. Retrieved 10 June 2016. Telles, Francismeire Jane; Lind, Olle; Henze, Miriam Judith (20 February 2014). "Out of the blue: the spectral sensitivity of hummingbird hawkmoths". Comparative Physiology a Neuroethology, Sensory, Neural, and Behavioral Physiology. 200 (6): 537–546. doi:10.1007/s00359-014-0888-0. PMID 24553915. Farina, WM; Varjú, D; Zhou, Y (1994). "The regulation of distance to dummy flowers during hovering flight in the hawk moth Macroglossum stellatarum". Journal of Comparative Physiology A. 174 (2): 239–274. doi:10.1007/bf00193790. Wikimedia Commons has media related to Macroglossum stellatarum. "69.010 BF1984 Hummingbird Hawk-moth Macroglossum stellatarum (Linnaeus, 1758)". UKMoths. Retrieved December 12, 2018. Pittaway, A. R. (2018). "Macroglossum Scopoli, 1777". Sphingidae of the Western Palaearctic. Retrieved December 12, 2018. This page was last edited on 21 March 2019, at 02:58 (UTC).